Varik Teitur once dreamed of becoming a doctor, but following the sudden suspicious death of his marine biologist father, Varik now oversees the family sea farming business. When an eco-terrorist group nearly destroys the world’s food supply, Varik is forced to team up with one of its members, who claims that Varik’s father had been working on a secret project called Fireseed. This miracle plant could be the answer to the food supply crisis, and so Varik heads into dangerously high temperatures with a less than trustworthy companion in search of Fireseed. I really like the idea of futuristic worlds, especially the technology they feature because I’m such a tech geek. What I don’t like as much is when a book with this type of setting gets bogged down by scientific details and draws all of the focus away from the plot and the characters. Fortunately, Fireseed One achieves a good balance between providing enough specifics about the world to draw your interest in and help you get a grasp of its workings without overwhelming you with too much information on sea farming and plant hybridization. These aren’t subjects that I’d normally find heart-pounding to read about on their own, but the way they were incorporated into the story here made them rather interesting. The world of Fireseed One is quite unique; there aren’t any others that I can readily compare it to. There are three territories—Ocean Dominion, Land Dominion, and the Hotzone. The further south one travels from Ocean Dominion toward the Hotzone, the higher the temperatures soar. Special heat-protective clothing needs to be worn to avoid burns. The climate up in Ocean Dominion, where Varik, the protagonist, lives, is the most comfortable, but to avoid an influx of people pouring in there, guarded borders separate the three areas. Many refugees live in the Hotzone, and they must rely on food shipments to trickle down to them. The Zone Warrior Collective (ZWC) is an organization that tries to draw attention to the refugees’ plight, but it does so through what are essentially acts of eco-terrorism. I thought this world had a very realistic feel to it. We’re all familiar with the dangers that polluted oceans, climate shifts, and melting polar ice caps pose, and the book portrays a future resulting from them going unchecked that is all too plausible. The book also features some very cool technology, though I’m not sure how I’d like the news transmitted directly into my head. I was happy to see that the characters were just as fleshed out as the world was. With his irrepressible charm, Varik’s friend, Audun, was a hoot. I also really liked Rain and Armonk, a mother and son whom Varik meets in the Hotzone. Their kindness forces Varik to rethink everything his father ever told him about Zone refugees. There are several layers to the novel, from the environmental extremes to the food shortage to Varik seeing firsthand that not all refugees are savage criminals. But the element of the story that I found most compelling was two characters’ journeys to step out of the shadows cast by their fathers’ reputations. Varik’s father was a highly regarded marine biologist, and his death left his son in charge of a sea farming operation that Varik wasn’t exactly enthused about having to take over. Varik performs his duties, but his heart isn’t in them like his father’s was. Dr. Teitur’s legacy looms large, but as the novel goes on and Varik risks his life to find the plant that could save the population, he forges a legacy of his own. Varik’s traveling companion to the Hotzone, Marisa Baron, also has a well-known father, although “infamous” might be a better way to describe Melvyn Baron and his highly questionable business practices. As a member of the ZWC, Marisa is literally quite the rebel, and she and Varik have a memorable first encounter—he catches her stealing from the Teitur underwater seed vault. The pair understandably get off to a tumultuous start. I liked Varik from the beginning; I had a lot of sympathy for him because he had to step in for his father and was suddenly awash in so many responsibilities. I needed some time to get used to Marisa, though; initially she came off as a belligerent fanatic, but she does grow significantly by the end of the book. Her desire to help the refugees is sincere and not merely an act of rebellion against her father and everything his wealth represents. 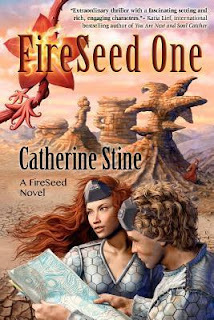 Fireseed One was quite different from what I usually read, and that’s what made it so intriguing. There’s also a fair amount of action, from Varik busting Marisa mid-robbery to their venture into hostile ZWC turf to their scary encounter with a Fireseed-worshipping cult. I was absorbed by Varik and Marisa’s race against time to find a new food supply, and the book didn’t disappoint in keeping the tension high. The concept here is very original and well-developed. There’s enough detail in the book to help you visualize the world, yet not so much that you’re bombarded with information. I don't usually comment on reviews of my own novels, but you TOTALLY got Fireseed One. I really enjoyed it, and I loved that it was so different from the YA books I generally read. I've had some difficulty with sci-fi/futuristic reads in the past, where there was information overload and I just couldn't take it. I thought this one was nicely done, though, putting the story and the characters first, which I really liked.